As much as we try really hard in the EatingWell Test Kitchen to use the entire “thing” when we call for an ingredient (e.g., we like to call for a whole can of broth, an entire vegetable, etc. ), sometimes we just can’t. And since I cook at home most nights, often from recipes, I know how annoying and wasteful that can be if I don’t think of a good way to use the leftovers before they go bad. I’ve composted my share of wilted celery bunches, dumped out moldy marinara sauce and forgotten about more than one half-used lemon in the back of my produce drawer. Here are some recipes to help you use up common leftover ingredients so you can eat well and save money. Use up your leftover cabbage... After you cut into a head, wrap it up tightly and stick it in the refrigerator for up to a couple of weeks. When you use it again, trim off any of the cut side that turned brown then start chopping. 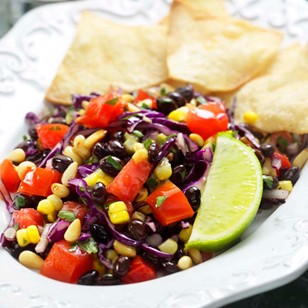 Southwestern Corn & Black Bean Salad is one of my favorite ways to use up leftover cabbage. I often have all the ingredients at home, and leftovers are great to take for lunch the next day! Click here for more great cabbage recipes. Use up that leftover marinara sauce... It seems that my husband and I can never use an entire jar of marinara sauce in one sitting. They’re not exactly made for two people, right? I usually stash the jar in the freezer for when I need it next. Try using some of your marinara sauce in this Polenta & Vegetable Bake, a healthful and comforting vegetarian casserole that is perfect on a cool spring night. Use up that leftover tomato... Slice it up for your brown-bag sandwich. I like to wrap the slices separately so it doesn’t sog out my sandwich.